VANKLEEK HILL, ON – The fifth anniversary of Beau’s All Natural Brewing is coming up on July 2nd, and the brewery will be marking the occasion with the release of three special beers, and using them to launch an ambitious new fundraising program. 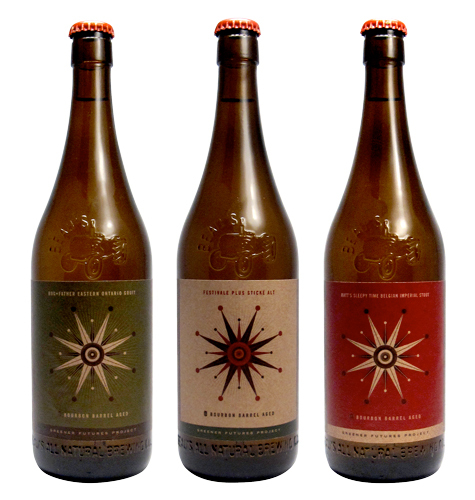 The new beers are limited edition versions of Beau’s Festivale Plus Sticke Alt, Bog-Father Eastern Ontario Gruit and Matt’s Sleepy Time Belgian Imperial Stout, each aged in a bourbon barrel. They will be available individually at the brewery, but are also the first three beers in Beau’s new Green Futures Program, an initiative to raise money for the installation of solar panels on the 30,000 sq. ft. brewery. For $300, supporters will receive bottles of 10 different bourbon barrel aged beers for the next three years, or 30 bottles in total. Beau’s is hoping to sell 600 of these “shares” in order to raise $180,000 towards the $500,000 cost of the installation project. Once completed, it’s estimated that the solar panels will be able to supply approximately 40% of the energy currently being used at the brewery.